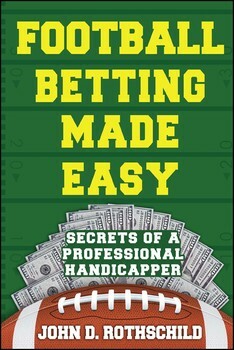 From one of the most respected football handicappers in the country, discover profitable football wagering made easy! John Rothschild starts you on your profitable journey with wild gambling stories that are hard to believe, but true. You’ll discover enlightening angles that will show you how to often win over 75% of the time. You really can make money wagering, and have fun doing it! Why most professional handicappers can’t win half of their games. Wagering advice your parents should have taught you. The nine biggest betting blunders most people make. Some of his own comical “big mistakes” that eventually helped him become so successful. John Rothschild’s easy-to-understand approach will help both seasoned professionals and novices. You won’t need to learn complicated theories—just how to use clear-cut, proven strategies. The more you read, the more you’ll profit!